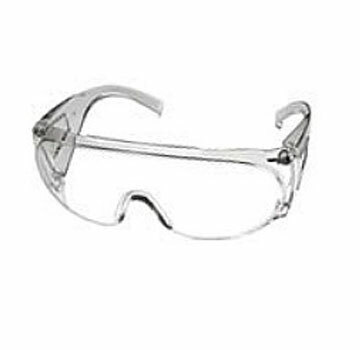 PRODUCT: OVER-THE-GLASSES SAFETY GLASSES / VISITORS GLASES. CAN BE WORN ALONE OR OVER PRESCRIPTION GLASSES. POLYCARBONATE. 99% UV PROTECTION. HIGH IMPACT / MEETS ANSI Z87.1, CLEAR WITH CLEAR FRAME. 12/CARTON. PRICE/CARTON. DESCRIPTION: Polycarbonate lens had 99.9% UV protection. Meets ANSI Z87.1–1989 Economy glasses with integral sideshields, brow and nose bridge - one piece construction. Rxcellent comfort, strength and stability. Universal fit. Fits over most regular glasses.